To celebrate Handcross School’s centenary in 1978, there were extensive activities in the playground and classrooms throughout the day. 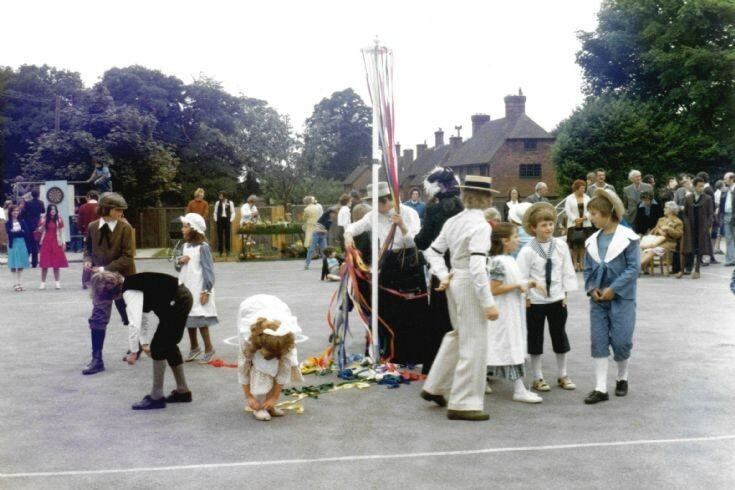 It seems that the maypole dancing had just finished and the ribbons needed some untangling! From the left I can spot Samantha Gordon in a blue dress with a white smock and bonnet, headmistress, Miss Roslyn Stenning, holding the ribbons, Miss Morgan in the black dress, Joe Ray in the grey suit in front of the gable end, and Fred Sired on the extreme right. Great photo. I think I am talking to Darren Ray, and Matthew Petch is bending over next to Jane Turville(?) who is tying her shoelaces. In the background with a pram is Mr Beet. That's me on the left in the green clothes, Dad's cap, and a black tie. In the background talking to Mr Beet, is Mr Bob Mellish.